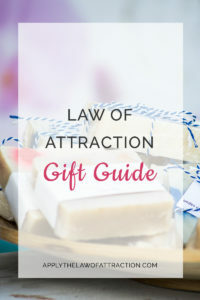 …but I've received so many questions about what Law of Attraction gifts to get people new to LOA, people who have been using it for years, etc. This isn't meant to be a huge commercial post about what you should buy this holiday season. These Law of Attraction gifts are not about pointless consumerism where the gift is only enjoyed for a day or two. These are gifts that enhance your life, improve your relationships, and manifest your dreams. There's no shame in celebrating the holidays with Law of Attraction gifts that are given out of love, friendship, and a desire to see someone happy. That's the true spirit of gift giving. And just because these are gifts for other people, that doesn't mean you may not find a gift for yourself. That said, let's get to the Law of Attraction gift ideas. I absolutely love these Vibrational Therapy Bracelets from VibesUp. The bracelets are made from various gemstones – amethyst and the like. They are then coated with a patented blend of theraputic crystals, gems, essential oils, and flower essences. Each bracelet has a unique patented blend designed to create a specific vibrational frequency, such as love, joy, abundance, stress relief, and protection from negativity. When you wear one, your vibration shifts to match the frequency of the bracelet, allowing you to attract their specific energies. For example, the love bracelet shifts your vibration to allow you to attract more love. There are 19 vibrational themes making it easy to find the right gift. You can also get $10 off any order for a limited time with the code vipdiscount10. A lot of the information available on the Law of Attraction isn't meant for children. Perhaps the most entertaining and easy-to-understand source for the Law of Attraction is the Sara series of books. Written with children in mind, the books follow the fictional character, Sara, as she learns about the Law of Attraction from an owl named Solomon. They're a great way to teach children the Law of Attraction at an early age so they can grow up knowing how to create whatever they want. Yet, the books are also enjoyable for adults, making bedtime stories a truly fun experience for all. Negative thinking has a major impact on your life. It not only affects what you attract, but it can also have devastating consequences for your health. You are the Placebo, Joe Dispenza reveals life-changing information on the effects of negative thinking. While the focus of the book is on health, this isn't just a book about your health! Yes, it's a very beneficial book for people with health issues. But it's equally beneficial for people without them because the information in it applies to anyone who wants to change any aspect of their life. Sound like anyone you know? This wonderful book delves into the impact of negativing thinking, how to end it, and how to improve your health at the same time. Step-by-step, easy-to-use tools are provided. Alpha is the brainwave level that produces the best results when visualizing. It's a deep, relaxing state where your brain and heart naturally come into alignment. Deep Alpha is a Grammy nominated album that contains music specially designed to put you in the alpha state. When listening to it during your Law of Attraction visualizations, you'll find that you're able to get into a deeper, more natural state of visualization – one where you can more easily focus on what you want to create, and truly immerse yourself into your visualization as if it were reality. This can be a great way for someone who has trouble visualizing to be able to visualize more easily and with fast results. Are you looking to create a customized step-by-step plan for achieving big goals this coming year? You can't go wrong with this Law of Attraction Success Planner. It helps you create a 12 month journey to your dream life. Whether you want to clarify your needs/wants/goals, create affirmations and visualizations, or know what steps to take to achieve your dream life, this success planner gives you the tools to improve your life. Best of all, it's available in a variety of colors – pink, black, gold and more. If you're looking for a Law of Attraction gift for someone who has every book, movie, and course on the Law of Attraction, here's one they probably don't. I was fortunate to get my hands on an early copy of Co-creating at Its Best. It's an awesome Law of Attraction resource and life manual. If you've ever wondered what would happen if two Law of Attraction experts got together, this book answers your question. It's a conversation between Wayne Dyer and Abraham-Hicks, during which Wayne asked Abraham the questions he accumulated from more than 40 years of teaching people how to manifest their dreams. It's truly an insightful guide to how the Universe works.